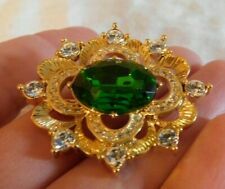 NAPIER EMERALD GREEN and CLEAR CRYSTAL RHINESTONE GOLD BROOCH PIN MINT! PIN IS SIGNED: NAPIER. BROOCH IS 1 3/4" BY 1 1/4". MUCH PRETTIER IN PERSON, STONES ARE NICE AND BRIGHT! The signed pieces are Avon, casual corners, AAI, JJ, gerrys(5), SFJ, LCI. Silver and gold tone. I inspected them as I can see all stones are intact. We will try our best to help you. · If you have any queries about the product/service expect a reply within 48 hrs. You get everything pictured, all 40 pieces. This is for crafting purposes. Both have gold tone settings and straight, secure rollover safety clasp pin backs. My Mom and Grandma collected brooches and pins for 50 years. The last picture shows the approx size of each brooch. There is a wide range of designs & styles in the lot with 42 pair being clip-on style & 29 pair of screwback earrings. They range in size from approx. 1/2" to 2 1/2". They range in size from approx. 3/8" to 1 7/8". Marvella specialized in high quality simulated pearls and this pin's center is a beautiful example. It also features pave rhinestone petals, marquise leaves, and a baguette rhinestone stem. One marked Sarah Cov. The rest unmarked. Vintage Starburst Brooch Faux Baroque Pearls Pastel AB Rhinestones Mint Sky Blue. Shipped with USPS First Class Package. Stunning Large Statement brooch is designed as starburst, covered in arms of pastel sky blue rhinestones and satiny baroque ivory pearls. An asymmetrical ring of mint green marquis stones accents the large center faux baroque pearl. The back has a center lacy doily that supports a security clasp. Nicely made, this piece measures 3” in diameter and is in excellent vintage condition. They just don’t make costume jewelry like this anymore. Vintage Mid Century Modern Retro Pink Greyhound Brooch. Appears handmade, missing one little rhinestone on the collar. Shipped with USPS First Class Package. You get everything pictured, all 41 pieces. This is for crafting purposes. All in wearable condition. Jewelry bundle was wrapped in bubble wrap, but not in individual bags. Untangling is part of the experience, right?. Lot includes. 1 silver spoon ring, size 7, marked 1847 Roger Bros. 1 spoon ring, size 7.5, marked WA Rogers Oneida. 1 toe ring with cz, size 4.5 before adjusting. 1 butterfly ring with cz's, size 5. 1 three stone cz, size 5.5. THIS IS UNSEARCHED, UNTESTED jewelry. It may show wear and it hasNOT been cleaned. I am very careful to look for missing stones, although I may miss one on occasion. All earrings are paired. THE JEWELRY IN THE PICTURES IS WHAT YOU"LL RECEIVE. There is a wide range of designs & styles, with 28 pair being clip-ons & 2 pair of screwback earrings. They range in size from approx. 1" to 3 1/4". We promise to resolve your concerns quickly and professionally. LOCAL PICKUP. Brilliant Brooch. Needs a cleaning. Included are: 11 PINS, 4 PRS. EARRINGS, 2 NECKLACES, 3 BRACELETS, 1 PENDANT, and 2 RINGS. Be sure to look closely at the photos for more details. I try to describe all of my jewelry, including any visible flaws, to the best of my ability. All are gently worn and seem to be in overall good condition (ie, all pins have the pin and clasp intact; nothing broken that I can see). There are 7 different pins including 2 "Mother" pins and 1 ring of unknown size and composition. These pearls are all fairly heavy in weight. There is a wide range of lengths up to 56". Great lot!! See photos for best description! Vintage Flower Power Silver Tone Brooch signed Sarah Coventry. Shipped with USPS First Class Package. All are miss matched, may have wear, missing stones, have v erdigris. Missing pieces ect. NO MORE EXCEPTIONS. Many signed and unusual pieces. Our offices are smoke free, but can not account for previous owners! THIS LOT CONTAINS 1 PIECE OF VINTAGE BRASS FLOWER BLUE SAPPHIRE GLASS RHINESTONE JEWEL 14 INCH CHAIN NECKLACE WITH 4.5 INCH EXTENDERS CIRCA THE 1970'S. CHAIN WIDTH IS 6mm. AND 3mm. THICK. The Jewelry Box in NOT included - it is for Display only. We will try our best to help you. New ListingHUGE Estate Sale Vintage Pin Brooch Lot Rhinestones Sterling More! There are a total of 70 pieces in this lot. These pieces vary in condition from fair to excellent. Others might need a gentle cleaning. We love unique and unusual things!